Special Price - 41% Off! 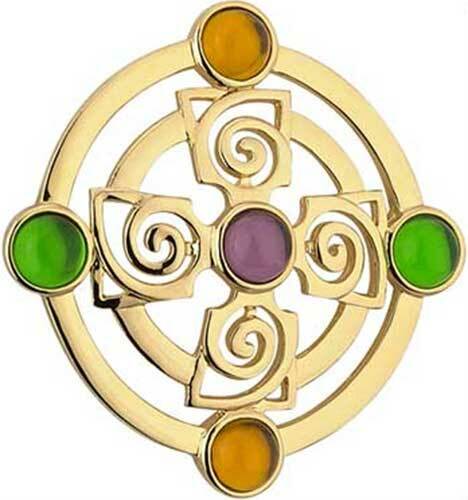 Celtic cross brooch features spirals and is enhanced with colorful glass stones that are set the gold plated design. Sorry, this Celtic cross brooch is now sold out. This Celtic cross brooch, like all Irish made jewelry at The Irish Gift House, is nickel free and hypoallergenic. This gold plated Celtic cross brooch features a Celtic spiral design along with multi color glass stones. The 2” wide and tall Celtic cross brooch is gift boxed with Celtic spiral and Celtic cross history cards, complements of The Irish Gift House. Celtic cross brooch is a gold plated design that features Trinity knots in the arms. This gold plated Celtic cross brooch is set in a shield and features stones as the arms of the cross.